ROSEMONT, IL (June 23, 2016) – Riddell, the leader in football innovation, today announced plans for an updated version of its InSite Player Management Software (ISPM) for use with Riddell’s InSite Impact Response System. The latest InSite software – ISPM 3.0 – delivers more robust information about player head impacts including the location of the impact and offers new training opportunities based on data trends by player. This update complements the existing software that provides football staff and medical professionals with a system to review player alerts and manage team rosters. The new software was field tested during the spring by several high school and collegiate football teams, with the official launch slated for August. Riddell InSite alerts the sideline to significant single and multiple impacts that exceed research-based thresholds based on level of play and position. InSite has become a valuable technology for football player monitoring and a tool that helps inform team staff regarding coaching and training opportunities based on a player’s alert history. Alert Frequency: This software identifies a training opportunity when a player records a higher number of alerts in a short period of time when compared to players of similar skill level and playing positions. Position Impact Frequency: This software identifies a training opportunity when a player recorded a higher number of 95th percentile impacts in a short period of time when compared to players of similar skill level and playing positions. Player Impact Frequency: This software identifies a training opportunity when a player’s current impact profile includes a higher number of 95th percentile impacts compared to their recent impact history. Players who receive this feedback may benefit from improved tackling technique or change in playing behavior. Additionally, scripting practices and defining levels of contact can help manage head impact exposure. Football team staff and medical professionals connect the InSite Alert Monitor to a computer with ISPM 3.0 software running to download player alerts. The data is collected dating back to the last download and new training opportunities may be identified for players based on their head impact profiles. 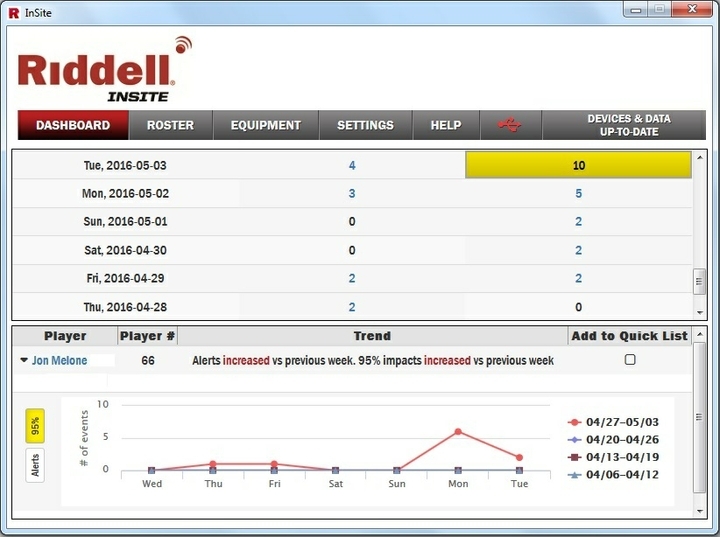 More information about the ISPM 3.0 software can be found via riddell.com/InSite.